To integrate online forms with a user's email and data into Iterable, you can do so via API or via Zapier. Many people use Zapier as an intermediary to connect their favorite apps to automate tasks without coding or relying on developers or an engineering team. All data field types will be strings in Iterable. To learn more, read Data field types in Iterable. Create a Facebook Lead Ads form. Make sure to include email as a field in your form since Iterable keys by email and will use that to update the user’s profile. In Zapier, make a Zap and set up the Trigger. For the Trigger, search for and select Facebook Lead Ads. Facebook Lead Ads is a Zapier premium app. New Lead is automatically selected. Click Continue. Connect to your Facebook Lead Ads account. Click on Test to ensure that you're connected; a green Success button will display. Click Save & Continue. In the drop-down for Page, select the Facebook page where you lead ads form will display. Click on the form you had created in step 1. Click Continue. In the next step, click on Connect & Continue. Then, you'll need to submit a test form or you can use Facebook's Lead Ads Testing Tool to submit a form with sample information. You'll receive a Test Successful! in green, verifying that the form data was captured. If not, re-test to get another lead. Click Continue. For the Action, search for and select Webhooks. Select POST and click Continue. For the Payload Type, select JSON in the drop-down. Under Data, email is required. Enter email in the left field and then select Email from the Facebook Lead Ads by clicking on the + icon. For any other user data fields, enter dataFields__NAME_OF_FIELD in the left field. Then, for the value, you can either choose a field from your Facebook Lead Ad or enter a value. Be sure to include double underscores between dataFields and the name of the field. For Unflatten, select Yes in the drop-down. Leave all other sections as-is and click Continue. Check that the user has been added to your project in Iterable by going to Users > User Lookup. 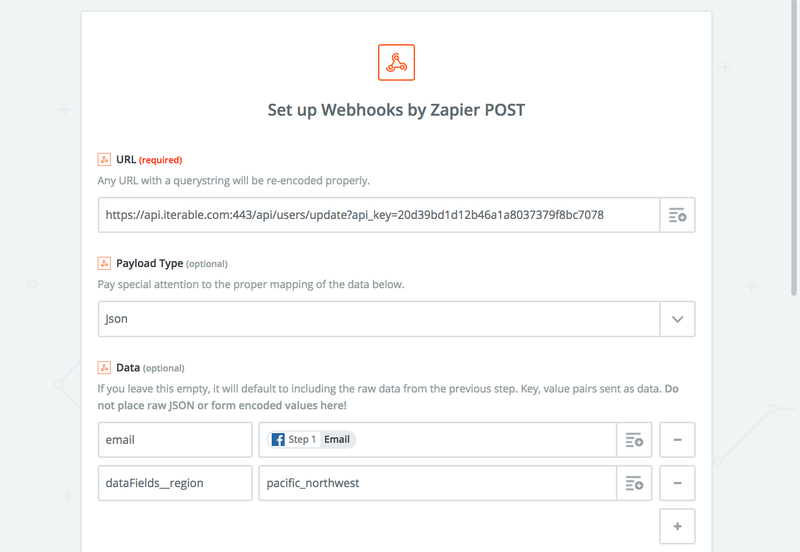 If the user has not been added to Iterable yet, click on Re-test Webhooks by Zapier to get another post to try again.